Having the right tires on your truck can make a world of difference at a work site. A new set of tires can be the catalyst for pulling your weight at a site or being washed out of a project due to lack of traction. Be sure to equip your Sierra 1500 with the right tires for the job. Tires are simply addicting. They have such a major impact on performance and drivability it’s unreal. 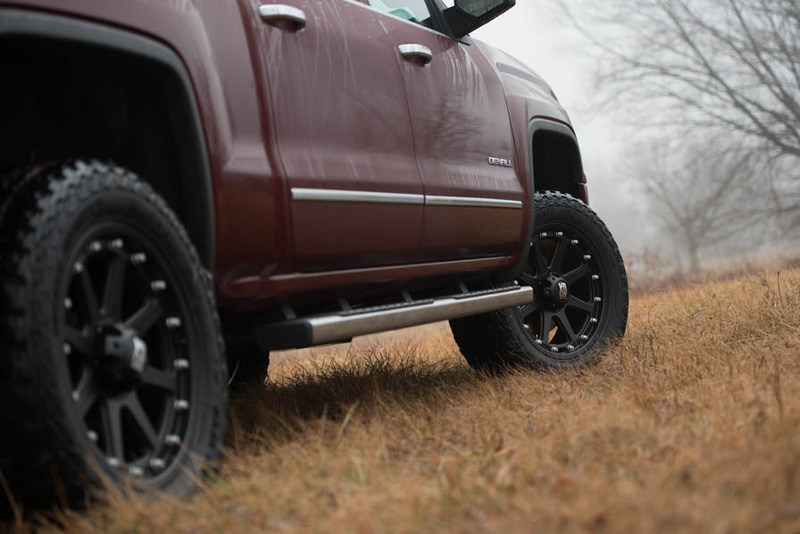 The right set of tires can be the night and day difference between the way your GMC Sierra 1500 performs and especially how it looks. Tires do have specific uses that they are intended for, and because of this it can be a bit of a trick to get the right shoes on your 1500. We’re going to break down some key areas of this market to help you find the best boots for your beast. Before getting started on this hunt we need to establish a baseline. 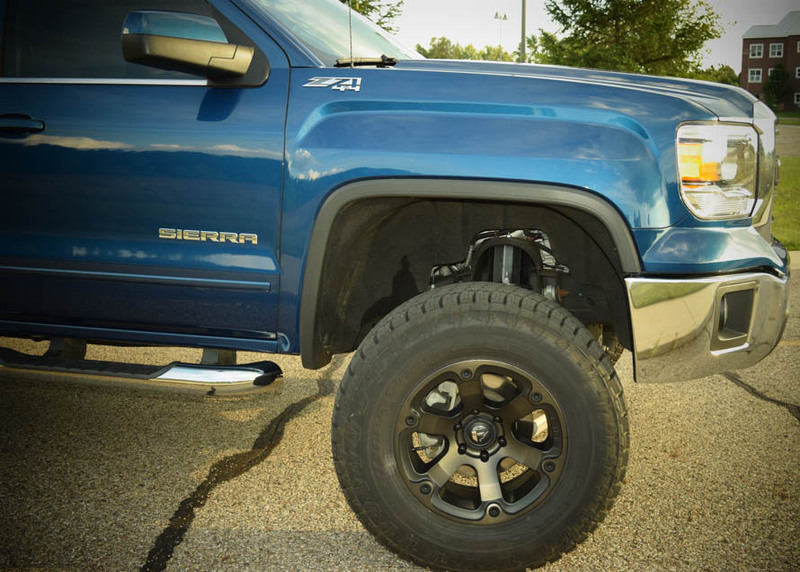 Your Sierra does have limitations on what can or cannot be installed on the truck in stock form. Knowing this will save you from spending a bunch of money on a set of truck tires you can’t even fit in the wheel well. Truck wheels and tires go together like peanut butter and jelly. If you’re upgrading your tires you’re probably going to be looking at some aftermarket wheels. Just like the tires It’s just as important to understand what wheels your truck can accept from the factory. Ok we’ve had our vegetables; let’s get onto the meat and potatoes. Tires come in so many different shapes and sizes and not any two are the same. They have set designations, and this is what sets them apart. There are a couple of popular designations for the GMC Sierra. We’re going to take a deeper look at what they mean and what works best when. AT: All-terrain tires are probably the most popular type of tread pattern for stock trucks. These are pretty much all-purpose tires. They’ll cruise down the highway without any rumble or wobble, you can cruise around town in any weather conditions with comfort, and they can come with aggressive tread patterns for some off-road uses. 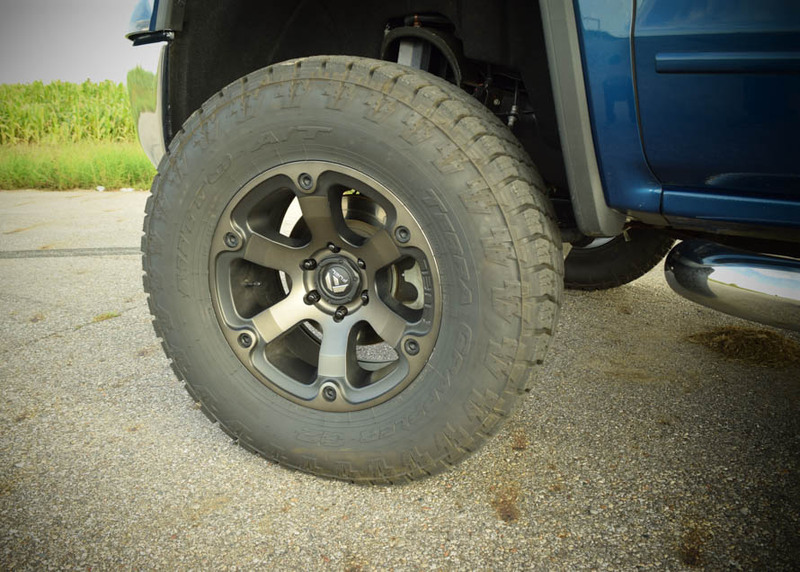 You can even find these tires ranging up to 35 inches in diameter, meaning you can still get that big truck look without compromising any drivability. 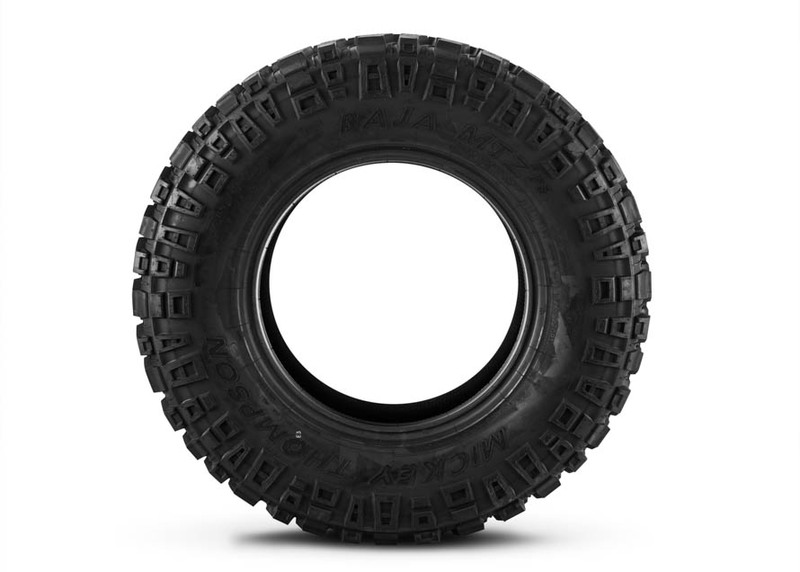 MT: Mud terrain tires are best suited for off-road applications. They have super aggressive tread patterns meant to bite into mud and give you as much traction as possible when you’re out 4-wheeling. Because of the aggressive tread pattern day to day use becomes compromised. They aren’t meant to work on hard surfaces like pavement, and they can be pretty noisy. It can be done, but it’s not recommended you use these tires on your daily driver. These tires can be massive ranging up to and beyond 40 inches in diameter. All Season: All season tires are best intended for street use only. These are meant to perform best on pavement. As the name implies they can handle any road conditions all year round and will deliver best in handling capabilities and street drivability. They lack aggressive tread pattern so going rock crawling with your buddies isn’t the best way to use these tires. They can come up to a 33-inch selection, which maintains that beefy truck look GMC Sierras wear best. It is hugely popular to slam big meaty tires on Sierras. The only catch is the truck can only accept so much when it comes to size. In order to get taller tires into the wheel well, you’re going to need to lift that truck up. A good rule of thumb is the taller the tire the higher the lift. We will give you a list to reference based on the lift height and the maximum tire size it can accept. Bigger tires aren’t just taller; they can be much wider. 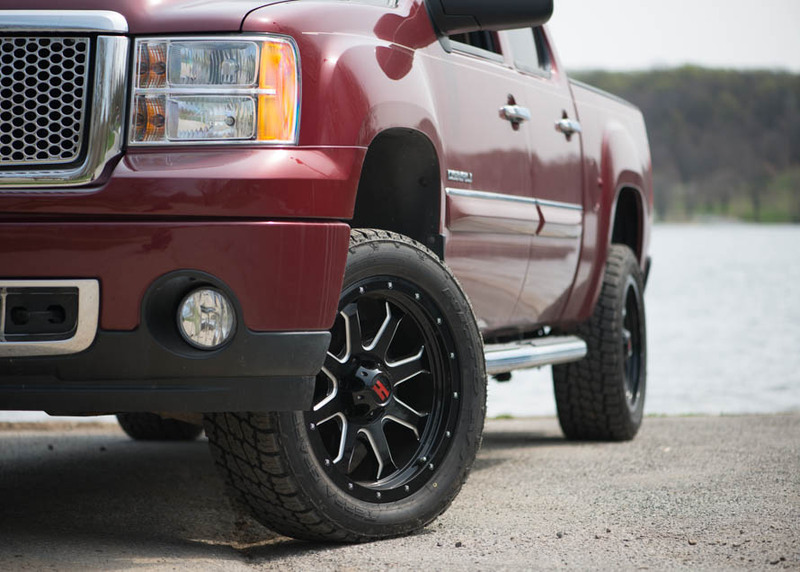 Truck lift kits don’t exactly compensate for wider tires, and you will need to consider aftermarket wheels. If you put too wide of a wheel on a narrow rim you’re going to risk the bead of the tire not setting properly. It will also lack in support for the tire and this can become extremely dangerous. It’s not as simple as just installing wider wheels though. They key is to pick up the right offset wheel. At first it can be pretty confusing, but it’s pretty simple. Offset is a measurement from the wheels mounting surface and the centerline. 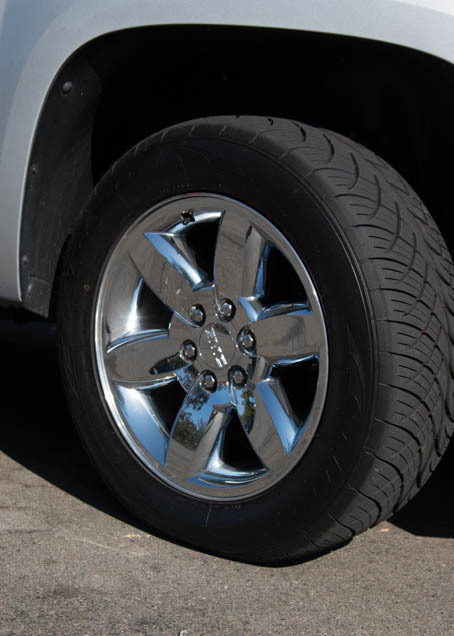 A positive offset moves the mounting surface to the outside of the rim, which moves the wheel in closer to the truck. A negative offset moves the surface closer to the inside edge of the wheel, moving the wheel outward. If you’re going to be sticking wider tires and wheels on your Sierra, you’re going to need a negative offset. This will move the tire outward and keep you from tearing up your brand-new tires on the truck itself. With that in mind, daily drivers can’t have tires sticking way out. The law doesn’t like it. but you can get by with a set of fender flares. They basically extend your wheel well, and, once they’re installed, you can tuck wider tires under your truck and avoid unwanted tickets just for expressing yourself. Mud terrain tires arrive in rather massive sizes. Reaching up and over 40 inches basically turns your Sierra into a monster truck. To fit these on your GMC Sierra 1500, major suspension and body modifications would be needed. These kinds of upgrades can be quite daunting, but once they’re made and you have those humongous tires, literally nothing can stand in your way.